These little ghosts are so simple to make. I use bought Madeira loaf, but chocolate, lemon, ginger or any leftover homemade cake will work. Pick up a copy of Waitrose Kitchen magazine in store for even more delicious recipes and exciting meal ideas. 1. Break the loaf cake into a mixing bowl, then rub with your fingers to create fine crumbs. Add the jam and mix together. Divide the mixture into 12 and roll into balls in the palm of your hands (you will need to press them together firmly). Put on a plate and chill for 30 minutes (or freeze for 10 minutes) to set. 2. Melt the chocolate in a bowl set over a pan of gently simmering water, stirring occasionally until melted. Stir in the vegetable oil to loosen a little; leave to cool slightly. 3. Dip the tip of a cake pop stick (available at Waitrose) into the chocolate, then stick it into the middle of a chilled cake ball. Insert the stick into a block of polystyrene or a loaf tin filled with rice to stand it upright, or lay it flat on a parchment-lined baking sheet. Repeat with the remaining cake balls. Chill for 30 minutes to 1 hour until the sticks are set firmly inside the cakes. 4. Dip the cake pops into the melted chocolate (which should be quite thick, but not solidified; reheat it for a minute, if need be). Turn the cake pops until they are coated evenly in the chocolate. Tap the stick on the side of the bowl to remove any excess and stick it back into the polystyrene or rice. Any chocolate that drips off will add to the fun ghost shape. Repeat with the remaining cake pops, then leave in a cool place for 30 minutes to 1 hour until set. 5. 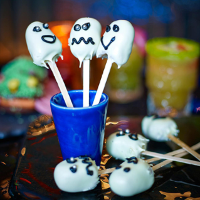 Finally, decorate the ghosts with writing icing and silver balls to give them eyes and mouths, as spooky or friendly as you wish. Per cake pop. More info: 3.5g protein, 0.2g fibre.